It came to be referred to as the Metz Massacre. 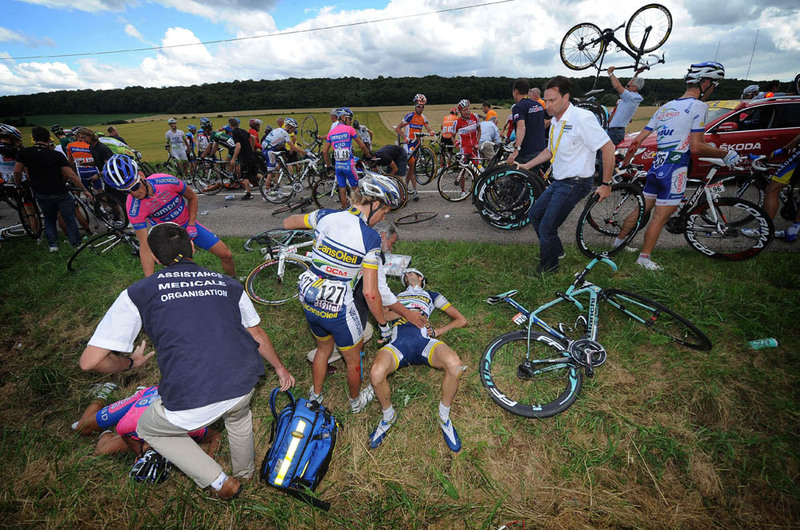 David Millar said it was the worst crash he had ever been involved in. With 25km to go of stage six of the 2012 Tour de France, as the riders sped along with the wind on their backs at close to 70kph, the Italian Davide Viganò touched a wheel and went down near the front. The overhead shots made it look as though an enormous bite had been taken out of the peloton. There was carnage and devastation. Riders were spread across the road and the grass verge, many of them badly hurt. Millar’s Garmin team seemed to be worse hit — all but one, David Zabriskie, came off — when they arrived at the finish in Metz with their clothing ripped and limbs bleeding. In fact they were lucky. Viganò damaged his shoulder, Mikel Astarloza dislocated his elbow and Oscar Freire and Maarten Wynants both had broken ribs and punctured lungs. And still there was somebody who was even worse off. Wout Poels, a hugely promising 24-year-old Dutchman, fresh from a stage win at the Tour of Luxembourg, remained lying on the verge as the other victims picked themselves up and inspected their injuries. He was in pain, but there were no visible wounds — no blood. Poels’s Vacansoleil directeur sportif was Michel Cornelisse, and he sprinted from the team car to attend to his rider. Cornelisse and Poels were very close; Cornelisse says he had a “special connection” with his fellow Dutchman. 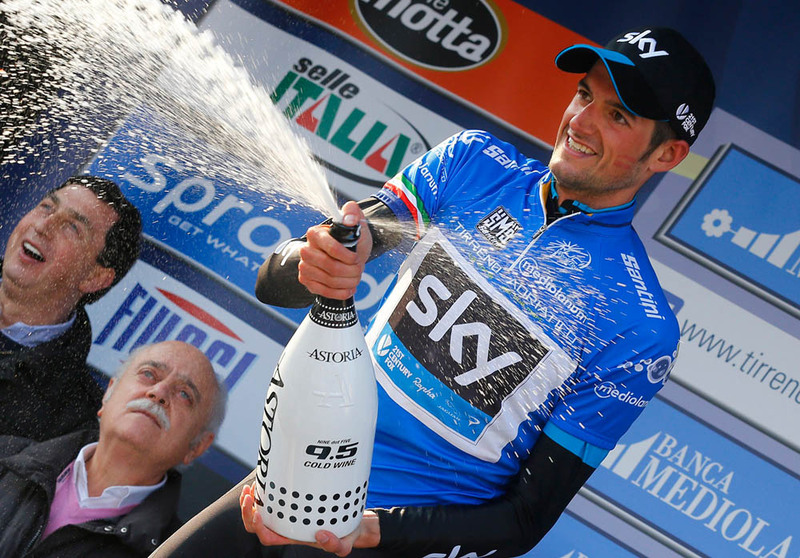 He had run Poels’s previous team, P3Transfer-Batavus, which Poels joined as an 18-year-old. “Wout felt pain but he didn’t think it was that bad,” remembers Cornelisse. “He wanted to keep fighting.” Poels’s father, Henk, his biggest supporter, had recently died and Poels was determined to finish the Tour — particularly as illness had forced him out the previous year. A doctor appeared and Poels told him he had a pain in his chest. The doctor prodded his ribcage and Poels grimaced but didn’t make a sound. He thought that if he screamed in pain — as he felt like doing — the doctor would tell him to quit the race. It was no good. After 10km he climbed off and into the team car, arriving at the finish slumped in the front seat, looking in severe discomfort. He was helped into an ambulance and taken to a French military hospital. A couple of hours after the last survivors had struggled home, reports began to filter through to the press room that there was a rider whose injuries went well beyond the road rash and fractured bones of the other victims. Poels had a ruptured spleen and kidney as well as three broken ribs and bruised lungs. He was in intensive care. It did not sound good. Ahead of him lay four rounds of surgery, many weeks in a morphine-induced haze, more weeks when he was confined to bed and couldn’t even visit the bathroom. Anybody familiar with the full extent of his injuries would have struggled to imagine his return to professional cycling. That could be Poels’s greatest challenge. He tells us that he almost joined Sky five years ago but that now, as he looks forward to his first season with the British team at their winter training base, he feels the timing is perfect. “Two years ago I didn’t expect to return to this level,” he says. He was only just back on his bike. “I had been two weeks in intensive care, and three weeks in hospital, then three months off the bike. My first training ride back, all my muscles had gone. That was really hard. At first, when they thought they would have to remove a kidney, the doctors told Poels he should prepare for retirement, that it would be impossible to race at the highest level. Within an hour, his brother, Norbert, who also rode at Continental level, had looked into this and discovered that not only Tjallingii but also Christophe Brandt rode professionally with only one kidney. His first time back on the bike was just after the 2012 World Championships in Limburg in his native Netherlands. He “literally had to learn to walk again” and it was the same with riding a bike. He started on rollers. But within two weeks he was training in Spain with team-mates Lieuwe Westra and Bert-Jan Lindeman and, to his (and probably their) surprise, he was keeping up with them. “That was a huge boost,” he said at the time. For the 2013 season he returned to racing with Vacansoleil at the Tour of the Algarve. He admitted he was apprehensive, that it felt like a lifetime since he had raced. He didn’t know how much he would suffer. He needn’t have worried. He finished a solid 23rd overall. It suggested that he could return to his pre-crash level, when the highlight, as well as the Tour of Luxembourg stage win, was victory in a mountaintop stage of the 2011 Tour de l’Ain (ahead of another promising youngster, Pierre Rolland), and three top-five stage placings — including second at the summit of the Angliru to eventual winner Juan José Cobo — at the Vuelta a España. He finished 17th in that Vuelta. Poels looks back on that performance with pride now, but it is also poignant because it was the last time his father saw him race. Henk Poels died the following January. Following his comeback, it wasn’t long before Poels was competitive again. He had top 10 placings at Tirreno-Adriatico and the Tour of the Basque Country, 28th overall at the Tour de France, and then a stage win at a race he especially likes, the Tour de l’Ain, this time ahead of Romain Bardet. Then Vacansoleil folded. It was bad timing because deals for riders tend to be concluded before the Tour, when there may still have been lingering doubt about Poels’s ability to return to the top. He got a one-year deal with Omega Pharma-QuickStep and enjoyed a solid 2014, riding the Giro in support of Rigoberto Uran — managing an impressive sixth in the stage 12 time trial — when Sky came back for him. His role at the British team seems clear enough. In Majorca he was one of a small group of riders — including fellow newcomers Nicolas Roche and Leopold König — selected to train with Chris Froome; it seems likely this trio will form the nucleus of Froome’s A-team as he attempts to regain his Tour de France crown. Two weeks later Poels was in South Africa with only Froome and a Team Sky carer for company. “I didn’t really know him at all, so I was a little nervous. For a camp like that you really want to click with someone, to be able to talk to them. But it was really good. After their time together in South Africa they have a good rapport, he says. Then again, according to Cornelisse everyone gets along with Poels. With his determination to keep going after his crash, and his return from potentially career-ending injuries, his toughness is not in doubt. But how does he respond to his former directeur sportif’s ‘criticism’ that he needs to develop a nasty streak?